Tiger Shark Approaches Kayak Fishing Anglers! In the July of 2005 I took a trip to the Big Island of Hawaii. It’s a relatively new volcanic island, and the ultra steep drop-offs just offshore and warm deep blue water attract giant fish. Thousand pound “grander” marlin and huge tuna have been caught within 100 yards of shore. That’s why I was there; I wanted to hook into the biggest beast possible. I had geared myself up for the fight of a lifetime, bringing over a mountain of gear, and thought that I was prepared for any situation. I was wrong. Two local kayakers told me upon my arrival that the tiger sharks had been “running thick” and I needed to have some way of fending them off in case I was approached by one. These sharks can get upwards of 1500 pounds, and they roam close- very close- to shore I had brought over a whole cooler of sushi-quality Norwegian mackerel to use as bait. When I went to a corner store to buy some ice to keep the bait fresh, I glanced at the newspapers, and to my horror saw a headline about tiger shark warnings. They had been spotted in the exact place that I had planned to launch! Here's a link to the article. The kayakers had told me of two protective devices. One was a primitive bang stick, which made an explosive charge that would get a marauding shark away once it had come within arms reach, but I saw that as a last resort and I didn’t want to hurt any sharks. Plus, who wants to wait until the shark is 2 feet from you? The other was a relatively new device called the “Shark Shield”. The way it supposedly worked is that it sends out electrical pulses that the wearer can’t feel, but the shark can feel with the jelly filled sacks in their snout called Ampullae de Lorenzini. In either case, I had no such protective devices with me, so it was either fish or stay on land. I could have chosen another location to launch, but there was no guarantee that sharks wouldn’t be there either, and in addition, I was more familiar with the currents and winds near the harbor. I decided to fish anyway, and during my entire trip in July, encountered no tiger sharks. The trip turned out wonderfully, and when I returned, I felt a bit guilty that I had gone on such a long journey without my wife, so we made plans to return to the island in August as a couple. We’d do some fishing, and a lot more sightseeing. As I planned the trip, I began to consider the fact that I would be bringing my wife out on a kayak with me, and that we might be approached by tiger sharks. Of course the first thought that came to mind was that, if we were attacked by sharks, we’d be orphaning our children, so I figured it was a good idea to plunk down the money to invest in a Shark Shield, even if the odds were that we would never see a shark. Thousands of couples kayak the same spots, so what were the chances that we’d run into trouble? To be safe, I bought it, and brought it with us. Well, when we got there, we planned to launch our kayaks the very next morning. 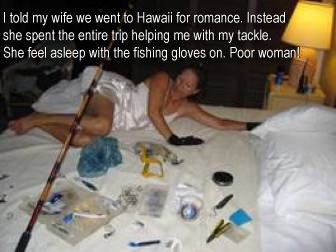 As always, I stayed up late making sure my tackle was all ready, and my wife helped me, even though she was exhausted. She fell asleep many times and then I’d wake her up to help me load my reels with new line and such. I guess I’m a hopeless romantic. The last thing we took out was the Shark Shield. I figured I’d just take it out, plug it in, and it’d be ready to use in a couple of hours. In fact, since the Shark Shield was there to protect my wife, I assigned her the task of reading up on it, but she was too tired and fell asleep next to the box with the manual in her hands! Well, when I opened the manual I learned that it takes a series of long charges to get it ready- and we were heading into the “belly of the beast” in 4 hours! So I plugged it in and in the morning we decided to take it with us, but leave it in the back of the kayak, coiled up, ready to deploy if we saw a monster. That’s NOT how you are supposed to use it- they are meant to be worn the entire time you are in the water, but we didn’t have a choice. We woke up before daybreak and headed out to the launch site. It was a wondrous day on the water- very sunny and calm. We had rented a stable double kayak that fit us comfortably, and even though my wife was totally new to the sport, she learned quickly, and we synched up our paddling strokes rather well. Much of the time, I’d simply tell her where to paddle and she’d get us going while I tended to the three rods and loads of tackle. The only thing missing on this perfect day was the fish- not a bite! And this was in the exact same location where I had landed three huge fish only a month earlier! My wife wanted to give up but I kept saying, “Let’s just give it another hour…” and then we’d be off in another direction. Finally we decided to call it a day, and on our way back, at the entrance to the harbor, I heard a splash…. This could be our lucky break! It must be a mahi mahi(dorado) or an ono (wahoo) or ulua (giant Trevally)! So I said, “Full speed ahead!” and she paddled us over there while I quickly dropped down a giant mackerel bait. I glanced at my fish finder and noticed a flurry of activity- a predator was obviously herding up the baitfish and they were running scared! The next events happened in what seemed like slow motion. I yelled, “There is something huge chasing fish here!” and we both looked up simultaneously. 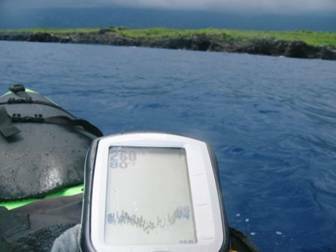 Something huge surfaced like a submarine… was it a dolphin? I had surfed enough to have learned to dull my panic reflexes when I saw a fin near me, as they are usually just pods of dolphins playing, so my first reaction was muted. The problem was, this animal wasn’t moving much, and its skin wasn’t navy blue- it was a tan color with darker stripes! It couldn’t be, I thought. How many times have we prepared for the worst and it never materializes? But it was… and my wife knew what it was, too. She yelled, “Put that thing in the water! Put it in the water!” and I reached around for the contraption. Thankfully, she had done the job of coiling it up properly. She is very orderly and knows how to pack things properly. If I had packed it, it would have never come out as easily as it did. I grabbed it and threw it as it unfurled with a ker-plunk into the water. Here’s the wildest part....as I was doing this, the shark, which had surfaced about 12 feet away and perpendicular to us, turned straight at us and began closing in. I reached for the yellow on switch and thought, “This thing better work!” and felt the switch click into the on position, hoping to the powers that be for a quick result. As soon as it clicked on, the shark acted like it had been annoyed terribly, as if it had hit a force field, and splashed it’s tail and turned away, gliding back into the depths and out of sight. All of this happened so quickly, but every part of the sequence is clear and fresh in my mind, as if the time had been slowed down by a factor of 10. We started hooting and hollering uncontrollably and going wild. The next thought I had was, no one is going to believe this! We have to get it on film… maybe we can bait the shark back up again and get it on film… but my wife convinced me otherwise. On the paddle back, we saw some kids jumping off the jetty into the water. We paddled over to them to warn them, and I started babbling about our encounter. I lifted the device out of the water to show them what had saved us, and ZAP! I got a nasty shock! I had left it on. As soon as we reached dry land I called everyone I could and told them about our amazing encounter with the tiger shark. Incredibly, my wife wasn’t upset, and only days later, agreed to another day on the water, in a different spot. We paddled out to Captain Cook’s monument in Kealakekua and snorkeled around. I was able to get some underwater footage of a beautiful omilu, or bluefin trevally. Usually they stay out of range but this one was very cooperative and seemed to be almost as interested in me as I was him. These fish have an incredible neon- blue tint to them. After a marvelous snorkel, we went fishing again. After three hours of paddling back and forth through a famous fishing spot called “The Kitchen”, we hadn’t even a bite, and our plane left in about 4 hours. 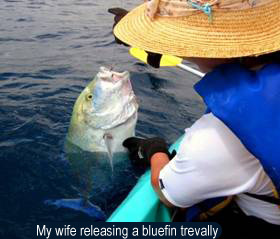 I desperately wanted to catch a fish with my wife and show her how fun the sport could be. We paddled over a reef close to where the waves were breaking, farther in than I would have liked, and a bait got absolutely slammed. I was going to pass the rod to her but this fish was no joke… it was towing us closer to the reef, so I had her paddle us out to deeper water while I battled the fish. I thought it had to be a tuna, the way it fought, but after 15 minutes, a gorgeous omilu, surfaced. It looked just like the one I that I had encountered in our snorkel! Could it be the same one? 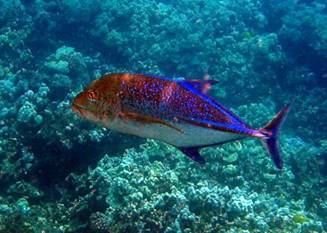 Everyone in Hawaii releases these fish so we set about the task of reviving him. You can’t just take the hook and out let them sink, you have to hold them by their tail and push them back and forth. I tried it for awhile, telling my wife all about the proper technique, but the fish wasn’t getting his energy back with me so she said, “let me try that” and took a turn at it. She did a much better job than I, and once it regained his strength the fish signaled his appreciation by kicking out of her hand. We both whooped and hollered and began the paddle back to shore. My wife had a huge grin on her face. I took some neat little videos of her releasing the fish and really they stand on their own as a fine “how to” guide to release a trophy game fish from a kayak. With no time to spare, we paddled against the furious current and actually for a second or two I became a bit worried as we had drifted way out. We found a break in the current and paddled to shore, and made the plane with only minutes to spare. If only every vacation ended with such a bang!